Safely clean ball caps without wrinkling them! 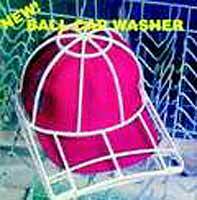 Now you can safely wash your favorite ball caps in the washing machine or even in an empty dishwasher, without destroying its shape. No more dirty ball caps, just place them in the Cap Shaper, throw them in your washing machine, and presto good as new. Good for ball caps, visors and wool caps as well.